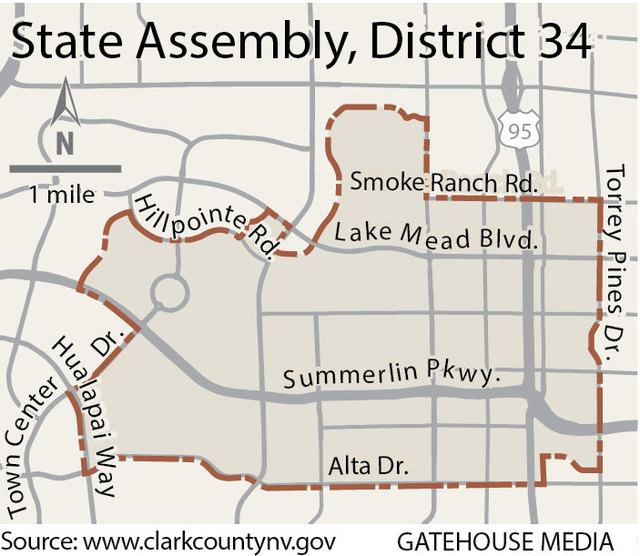 Several political newcomers are vying for an open seat in Assembly District 34. Democrats will try to regain control of a district that had been blue for more than a decade until Victoria Seaman defeated six-term incumbent William Horne in the red-wave Republican shift in 2014. Seaman is running for Nevada Senate District 6. Shannon Bilbray-Axelrod, Zach Conine and Manny Garcia are all hoping to be that Democratic champion. Bilbray-Axelrod has some political experience — she worked for Rep. Dina Titus, D-Nev., from 2009 to 2011 and works as a producer for a fledgling political campaign consulting company called Organized Karma. But like the other challengers in the district, she is entering an election for the first time. If elected, she said she would push additional funding and more options for early childhood education, and wants to make full-day kindergarten mandatory statewide. She also wants Southern Nevada to shift its focus away from elevated expressways, which are now being considered by transportation officials, in favor of light rail. Conine came to Southern Nevada by way of upstate New York in 2003. He was the chief business development officer for Fifth Street Gaming, and helped oversee the redevelopment of the Downtown Grand as it left its Lady Luck Casino roots behind in 2013. He started a consultant company in 2014 — Joseph Beare and Co. — that helps startup companies get off the ground. He wants to see more emphasis on STEM — science, technology, engineering and math — in public schools. Conine wants to help people coming out of prison rejoin society through job training and other programs and is an advocate for not transferring control and ownership of Nevada’s public lands to the state, saying it would be far too costly to do so. Garcia, an electrician, is running because he feels that Seaman failed to represent the district’s voters. “All I see that Seaman did is put Nevadans out of work,” he said. Like Conine, Garcia said that for Nevada to attract businesses, there needs to be properly educated graduates for them to hire. To help, Garcia said he would push to build more schools, hire more teachers and make their salaries more competitive with states such as California and Oregon. Garcia said he wants to see rooftop solar be more viable in Nevada, but knows that coal-energy companies will have to have a voice in the discussions. Republican voters will choose between a retired police officer, a state worker and a recent graduate of UNLV’s Boyd Law School. 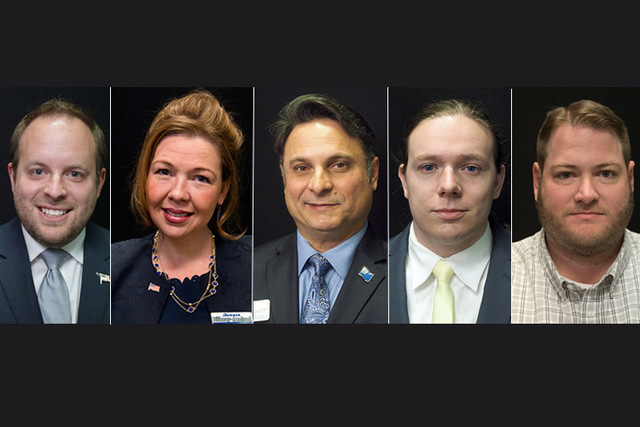 Marty Hagans, Matt Williams and David LaBay, respectively, are hoping to keep District 34 red for at least another two years. LaBay graduated from Boyd in May and is a lifelong Nevadan. He called the state’s K-12 education system “an embarrassment” that needs to be changed, but doesn’t think additional funding is the answer. “Throwing money at the problem is not a solution, as administrators and inept teachers continue to line their pockets at the expense of our children,” LaBay said. Instead, he said he is an advocate for alternative options such as charter and magnet schools. Hagans spent 11 years as a police officer in California before retiring after a car crash. He moved to Las Vegas 14 years ago and was a security director for World Market Center. His views on key issues stem heavily from his experience as both a law enforcement officer and a resident of California. He is morally opposed to Question 2 on the ballot, which would legalize recreational use of marijuana. Hagans said he sees marijuana as a gateway to harder drugs such as heroin and crack. He also opposes nearly all tax hikes because he feels they hurt small businesses, again citing his time living in California. “This state is very quickly going to become a small-business wasteland,” he said. Williams is an administrative assistant for the Corrections Department and works at the Southern Desert Corrections Center. But he has a hint of political experience, as he worked for Gov. Jim Gibbons’ campaign in 2006 and briefly worked on the governor’s staff. Williams wants to protect free speech on the state’s public universities and also is in favor of enacting voter identification laws to prevent fraud during elections. Contact Colton Lochhead at clochhead@reviewjournal.com or 702-383-4638. Find @coltonlochhead on Twitter. Occupation: Principal, Joseph Beare and Co.